I always think that, in order to have an opinion on something, you should have tried/read/watched it. Obviously, this doesn’t apply to the more extreme end of the opinion scale – guns are bad and heroin is too, if a little moreish. A few years ago, I read all of the Harry Potter books apart from the last one (which hadn’t been published). Last weekend, I decided to read the last one. It’s no secret that I’m not a Harry Potter fan. I’m definitely not a JK Rowling fan. I find the whole Harry Potter hype machine a bit distasteful – adult covers, theme park, chocolate frogs…I remember JK Rowling assuring parents that everything with the Harry Potter name on will be educational. What’s educational about Bertie Botts’ bogging beans? Sometimes it seems that the general public can’t see beyond the message spoon fed from the media – we’re told that Cheryl Cole is a national treasure so the majority of people forget that she was convicted of assaulting a bathroom attendant (nevermind the fact that she’s an unsuitable role model – famous for next to nothing and unnaturally skinny), Ricky Gervais is funny and that the Harry Potter series is well written. 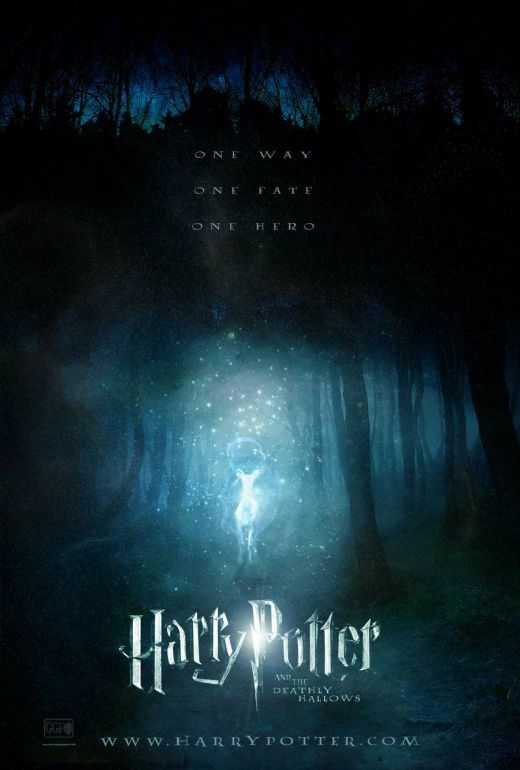 The basic outline of Harry Potter and the Deathly Hallows is that Dumbledore’s dead but has charged Harry with one last quest to finish Voldemort once and for good. It’s a typically ‘dark’ book, which basically means that lots of it takes place at night. Throughout the narrative the situation for the Dumbledore supporters gets worse and worse – the Ministry of Magic falls, Hogwarts is run by Death Eaters and Harry’s scar is burning more and more, signalling the strengthening of the connection to Voldemort. So far, so predictable. I find that the mark of a good book/story/whatever is that the reader disappears into that world or situation so completely that you don’t even remember turning the page. When that happens, I can hear the characters talk and smell the ocean spray and it’s difficult to come back to real life. With Harry Potter and the Deathly Hallows (and the rest of them, to be honest) I found it hard to get in to the situation. It was a bit like watching a badly directed film – I couldn’t tell where some characters were, people appeared from nowhere (having not previously been mentioned) and issues were resolved without being mentioned again. Specifically, this happened with the Sword of Gryffindor, which was taken by the goblin Griphook (nice name, by the way, very inventive) during the bank raid. In the final chapters, the sword is brandished by Neville Longbottom, who destroys the final horcrux with it. If I missed how they got it back, please feel free to let me know, but I didn’t read anything about that. Aside from the gaping plot holes (such as when Harry and Hagrid reminisce over their first meeting, when Harry was eleven, and then later on remind the readers that it was Hagrid who delivered year old Harry to the Dursleys), the dialogue’s awfully clunky. None of the characters have voices of their own more substantial than dwarves – there’s Grumpy Ron, Doc Hermione and Dopey Harry. There’re only so many times it’s possible to read how Harry feels sad that Dumbledore’s dead, Hermione wants Harry to concentrate on occlumency to keep Voldemort out and Ron has lots of brothers, before getting bored. In the action end battle scene Grawp the giant spots a baddie giant, shouts ‘Haggers’ and then they wrestle. Ten pages later, Grawp the giant spots a baddie giant, shouts ‘Haggers’ and then they wrestle. Boring, isn’t it? Unfortunately, that’s not the only thing to be repeated. The last book follows in the previous six books’ footsteps – Harry’s in trouble, Voldemort’s back, Harry has nice friends, Harry learns a lesson, the end. The thing I found most frustrating is that some events/people/minutes are described in excruciating detail whereas others, like the death of major characters, happen ‘off-screen’. This leads to a disjointed pace which means the readers either have to fill in the blanks or just be content to wait for the film to come out. So not only is Rowling incapable of sustaining an interesting conversation between characters who sprang apparently fully formed from ‘her’ brain, she can’t keep track of her own plot points and apparently has no editor to point out these flaws. All of this before pointing out my biggest irritation with the Harry Potter series – the blatant and disrespectful plagarism displayed proudly throughout all of the books. Tolkien perhaps suffers the most, as the dementors are clearly not very well disguised ring wraiths, while Dobby is a parody of the cringing, traitorous Gollum. Few fantasy writers escape from the theft though – Pullman’s daemons are lifted as the spell cast Patronus – which reflect the creator’s personality and are usually fixed into place by puberty. I’ve heard lots of arguments against this – everyone steals, you can’t read a book without stumbling into an idea from somewhere else, the fantasy world has a reserve of ideas and conventions to draw on and the best one of all – they’re books for kids. Right. Not everyone steals. A proper writer is able to create their own ideas, which may be influenced by other books they’ve read but are underpinned by their own philosophies to an extent that something new is added. Pullman’s books include a dedication to every book he has ever read, a fittingly humble paragraph which serves, to me at least, to make him a better writer than I had previously thought. Yes, the fantasy world has a kind of shorthand which makes it easier to convey ideas or at times, subvert them. Werewolves are a good example of this – you say ‘werewolf’ and you’ll probably think of silver bullets, full moons and maybe Jenny Agutter’s breasts. Rowling manages to pick the most boring name for her werewolf (Remus Lupin – really? Remus as in raised by wolves and Lupin as in a bastardisation of Canis Lupus, Latin for wolf – genius) and play within the rule so completely she may as well have not bothered. Yawn, he gets ‘sick’ around the full moon. Lastly – the ‘but they’re for the kids’ argument. That’s not an excuse for them to be below par, badly written, unimaginative tomes with horrible 2D characters in. If they’re for kids – why are there adult covers? Why do I know lots of otherwise sane and intelligent adults who love the whole Harry Potter world and all who sails in it? Whenever I see a child with a Harry Potter book clutched in its little paw, I want to run over and exchange it for something better, something deeper – The Little White Horse, CS Lewis’ Chronicles Of Narnia, Garth Nix’s Abhorsen trilogy even Mallory Towers – anything but the looming spectre of Hogwarts. Aren’t we supposed to love our children? Why would we want them to be happy with mediocre prose and ignore the amazing literature that’s out there? I like the tradition of wizarding families and the links that bind deeper than the magic. I think it’s a bit neat that the parents of the kids in Hogwarts were all in the same year at school, but nevermind. I still enjoy the rivalry that continues long past graduation as well as the weight of the ancestors that comes with a long line of notable wizards behind you. The Death Eaters are quite nicely drawn, and I appreciate that they’re not all completely evil, and some (such as the Malfoys and Snape) even enjoy a reprieve of sorts. Most of them are bad and stupid though, which is a bit disappointing as Rowling had a real chance to illustrate the force of the ties that bind – family, allegiance and fear, or in Harry’s case, lurve. Finally. In the final chapters of Harry Potter and the Deathly Hallows, Voldemort waits outside of Hogwarts’ gates for someone to bring him Harry. The houses are gathered together before evacuating the little ones (sound like Helm’s Deep?) and following an ultimatum by Voldemort, a Slytherin (boo, hiss) stands up and shouts that Harry is right there and that someone should grab him. The children do indeed stand up, but those from the other houses face the Slytherin table, wands drawn. I am a sucker for gracious kids. Apart from all of the technical faults and the plot holes, the plot itself, the climax of the last six years or however long it’s been, doesn’t make any sense. Harry’s been carrying around a piece of Voldemort’s soul for the last seventeen years and no-one’s noticed, least of all Voldemort? Voldemort doesn’t notice when his horcruxes are destroyed, even though they hold the most precious parts of him? In a world where enchantment and protection spells are rife, this is very strange. He has faithful Death Eaters – couldn’t he have posted them to guard his precious items? That’s before we’ve touched on the fact that one cannot live while the other survives, except it turns out that they’re so inextricably intertwined, surely Harry should die? If Rowling’s sticking to the accepted fantasy conventions, an evil spell or curse is every difficult to remove from a person’s body, let alone when it’s part soul. I dislike books that are neat and wrapped up, especially when it’s done clumsily. The fact that the numerous wikipedia entries theorise and explain many of the occurrences in the books make me think that the fans themselves either fill in the blanks, or they’re happy to ignore the major plot errors. As always, I am happy to listen to anyone else’s point of view, if I’m wrong – please tell me why and more importantly – if anyone can fill in the gaps I mention, I’d be grateful. However, I doubt that I will ever visit the Harry Potter theme park and I will definitely never, ever give anyone a Harry Potter book as a present. I totally agree. Cannot compare with classics by Charles Darwin or Robert Louis Stevenson. Ah yes Charles Darwin the talented children’s book writer. Of course many people would like us to believe Darwin’s ideas are a work of fiction… I think you means Dickens. You obviously havn’t read the books properly then have you, the sword of griffindor does not stick to one person, if someone from griffindor house is in urgent need of help or deserves it for what they are doing the sword will apparate near/next to them but when unused it will return to hogwarts/hogwarts’ headmaster, also the books don’t only have adult covers because j.k. rowling made 3 versions of the books, the adult version, the kids version and the bloomsbury version. Another thing, her written conversatiobs aren’t boring or uncreative, they are realistic and descriptive conversations between characters which leave hints in their speech and it also includes accents which most books don’t include to give the reader an idea on how the characters speak. So before you decide to go all smart arse, and rant on how much you think the harry potter series is rubbish with crap literature because to be honest with your immature rant on how j.k. rowling has copied every other fantasy book in existence read up on your facts and try not to make an arse out of yourself because all your points are invalid. The Sword of Gryffindor appears when one has need of it from the Sorting Hat- you learn this in Chamber of Secrets. As for Harry and Hagrid- yes, Hagrid delivers Harry, but he was one, and Harry doesn’t remember it, and they didn’t speak- their first proper meeting was when Harry was eleven. I do agree that the characters are a little dull for those who aren’t like me, who’ve done a ridiculous amount of research and analysis into all the stuff they say simply because we like to. The Tolkein thing? I agree. I am a major, major, major fan, and I agree. I haven’t read LOTR, but my friends have and I’ve seen the first movie. Wow, is it a copy. But I love it anyway. Sure, for you it might not be “proper” literature, but it is for me! Anyway, I said at the start I won’t attack you for the things you said and I won’t. Just pointing some stuff out. Feel free to email me about this. It’s ella.sparrow1@gmail.com. I find myself hating the series as a collective be it books or films the more that I read/watch/hear Rowling speak of her vision and stance on some things. Like for example the fact she didn’t let Draco truly redeem himself because she self admittedly doesn’t like the idea of him transitioning to a proper anti-hero or good guy. Also as much fun as I had reading the books and watching the films I’ve never gotten it out of my head how much of a black and white stance Rowling set for the whole series when Dumbledore awarded Gryffindor the House Cup at the end of first year finding any and every excuse to give them just enough points to take it from Slytherin. All the rules that Harry, Ron, and Hermione broke in the process of their heroic actions were ignored indirectly encouraging to keep breaking the rules. Then there’s the way she writes about Dudley (I think she must’ve been channeling her auger at her own childhood bullies from how mean-spiritedly descriptive she gets in lines about him) and how she constantly wants to put Harry in a position where the audience is going to feel sorry for him. His parents were murdered, he lives with borderline abusive relatives who make him spend most of his time waiting on them and locked inside a cupboard/storage space under the stairs, his escape from their home is thwarted by the death of his godfather who honestly didn’t need to exist if she was going to get rid of him the way that she did, a prophecy about him and Voldemort has kept every powerful or capable wizard the world over from even attempting to cast the Killing Curse on Voldemort and do away with him instead of waiting around for a child to do it for them, etc etc. It honestly just got boring after the 3rd book how much she threw everything but the kitchen sink Harry’s way. With respect to a revisionist history, had all Harry Potter book plotlines been condensed into a single volume building up to confronting Voldemort in the final chapter, then that would have removed much of the fat. This would have the added bonus that further books could have been used for other stages of Harry’s life, confronting other non-Voldemort protagonists (son of Voldemort, haha), bearing the emotional scars from his yesteryears.